130 mm/58 SM-2-12 х 2 pcs. 45 mm CM-164 х 2 pcs. 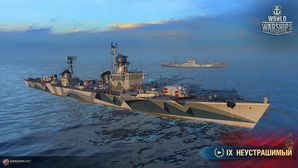 Neustrashimy — Soviet Tier IX destroyer. The first destroyer of the Soviet Navy designed and built after World War II (Project 41). A number of innovative solutions were used in the ship's design, including the most advanced torpedo tubes and the latest artillery mounts, which served both as dual-purpose main battery and AA defense. Neustrashimy (Неустрашимый, Dauntless) was a destroyer built for the Soviet Navy in the early 1950s. She was to be the prototype for an extended production run but only one ship was built. Neustrashimy was considered too big for series production and a modified design, the Kotlin class was chosen for series production instead. The Soviet Designation was Project 41. This was the first Soviet ship to be given a NATO reporting name being called the Tallinn class. This page was last modified on 31 December 2018, at 21:36.